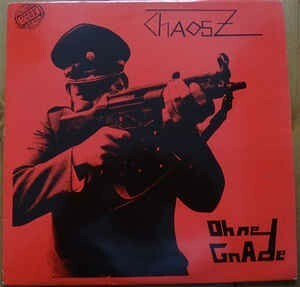 Background/Info: ChaosZ was a German punk band from Stuttgart active in between 1980 and 1983. After their split they moved on under the Fliehende Stürme moniker. This band has been more prolific and is already familiar with Alice In… on, which they released the album “Warten Auf Raketen” in 2011. “Ohne Gnade” was the official debut album of ChaosZ released in 1982. The album was completed by other cuts taken from the maxi “Abmarsch” and a few other rarities taken from compilations. Content: Alice In… goes punk! It’s a rather unexpected move, but on the other side a rather familiar phenomenon as more and more 80s releases have been re-released. The music has no real secrets and sounds into pure and good-old traditional punk driven by furious drums, dark guitar riffs and bass guitar. The main particularity for non Germans is the language. 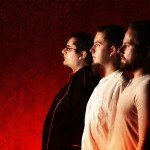 ChaosZ sings in their Mother tongue so it’s impossible to understand the lyrics if you’re not German. A few cuts are less punk inspired and more into cold-wave music. + + + : If you’re into punk and/or you want to discover ‘old’ punk bands “Ohne Gnade” is definitely worthy of examination. It’s pure nostalgia and I have to say that they are some cool songs in the genre featured on this opus. The tracks are short and powerful and even if you don’t understand the lyrics you’ll have some fun discovering this work. I think the ‘extra’ songs taken from compilations will be a real bonus for early fans of the band. – – – : “Ohne Gnade” sounds like a phantom from a distant period featuring nothing new. It also is a really surprising release on Alice In…, which I didn’t really expect on this label. Best songs: “Isolation”, “Zwang”, “Immer Noch Keine Antwort”.